Posted in: Art, Music, Nature, Photography. Tagged: French, Italy, Jean-Baptiste-Camille Corot, Landscape, memory, Nelson-Atkins Museum of Art, Oil on canvas, Otis Redding, Paris, The Dock Of The Bay, View of Lake Garda. "Jean-Baptiste-Camille Corot was one of the leading French landscape painters of the 1800s. During repeated trips to Italy between the 1820s and 1840s, he dedicated himself to painting and sketching from nature. Later in life, when he preferred to work in his Parisian studio, Corot relied on these sketches for inspiration or painted landscapes from memory. 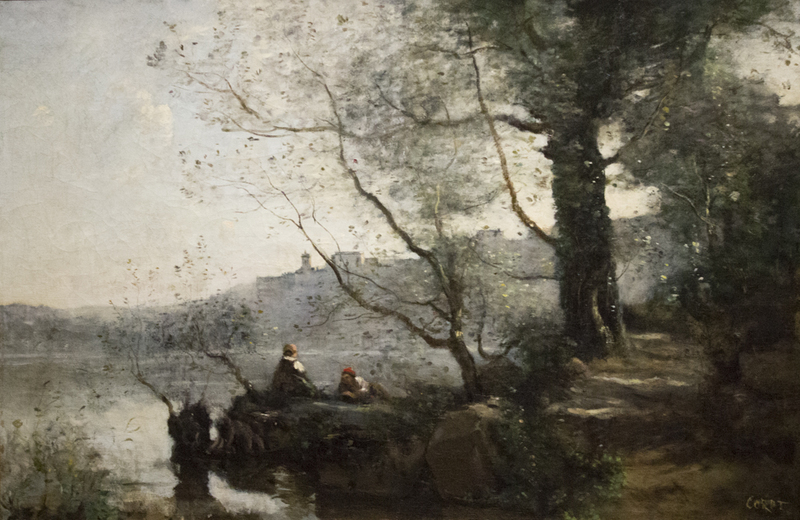 In this painting, a boatman and a contadina (Italian peasant woman) lounge on the banks of Lake Garda, a site that Corot had visited three decades earlier." I really like his treatment of leaves and his colors. Me too, the colors are kind of subdued. How beautiful. I’ve actually been there. That’s pretty cool, it looks really serene. It was years ago, near my parents hometown village but so lovely. Artistic and inspiring! Happy forthcoming weekend, my Friend!